Our home has been becoming more and more difficult to live in. Not because it’s not nice, but … maybe an example might serve to illustrate. We have been packing like crazy people. Since the movers come Monday the 23rd, the pantry, refrigerator, and drawers have all been packed. Thursday’s dinner was to come from a can, definitely for convenience sake, but then I realized that the can opener had been packed,. Thanks to our wonderful neighbors we didn’t have to resort to violence. Thus, we were glad to have plans to have dinner out with friends the last night we were to spend in our home. We had a wonderful time with them and one of their two daughters whom we have watch grow into a lovely young lady over the years. So, that was Friday night, but with lots of packing yet to do, what about breakfast the next day? 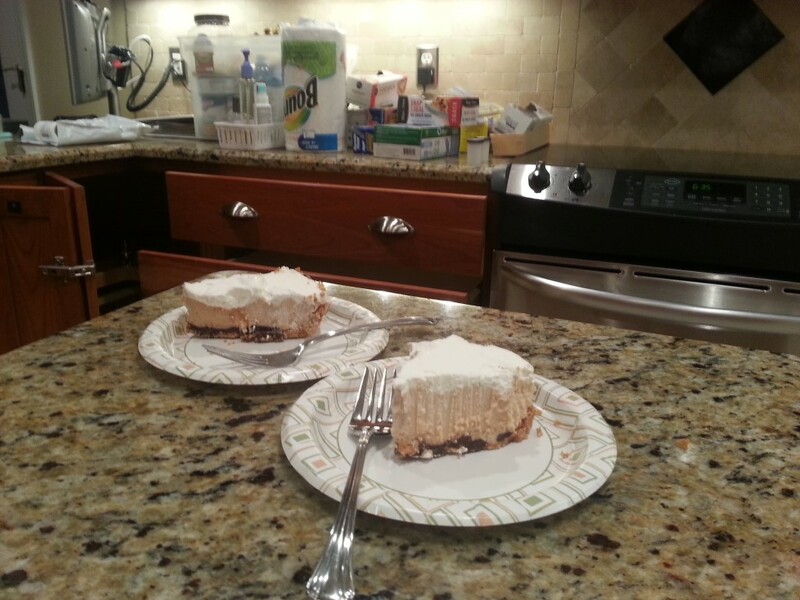 Well, another great friend has made me peanut butter pies for my birthday (in August) for many years. Now understand, these are not ordinary peanut butter pies, they are not necessarily healthy, but as a result these pies are exceptionally de-e-e-e-licious. There has always been enough for me to freeze and enjoy occasionally, and time in the freezer (almost a year) does not diminish the deliciousness significantly. We woke up early, as usual, made coffee and pulled our last two slices of peanut butter pie from the freezer, and had breakfast in bed. What a treat, and as the sugar and caffeine kicked in, packing resumed with a vengeance. Jeannie has been most challenged packing her clothes. As we have mentioned before, there are three primary considerations. What we downsize into long term storage, what we need for the next six weeks, and what we will be able to pack into a suitcase for up to a year in Europe. A picture is worth a thousand words. Note all the empty hangars. Kudos on the packing decisions. And the breakfast sounds wonderful. I’d like to take a trip like this some day! Thanks David, it’s not as easy as some think. Spin out a few miles for Jeannie and me.